In his classic study, The Hero with a Thousand Faces (1949), Joseph Campbell argues that the “hero myth” is a universal aspect of human culture — a myth that bears a fundamental tripartite structure. First, the hero departs the ordinary world in order to undertake a quest in a strange and dangerous realm. Next, the hero is initiated into a number of trials, which threaten her task. And, finally, the hero returns to the world from which he came, not only with greater self-knowledge, but also with a gift (or “boon”) for those left behind. Campbell is clear that these stages do not necessarily unfold in the same way; rather, it is the structure that is consistent, so much so that he refers to this heroic narrative as a “monomyth.” In other words, despite the differences separating various tales (say, about Beowulf, Odysseus, and Jesus), they are all united by an underlying framework. Of course, Campbell’s theory has garnered critical scrutiny over the years, but it nevertheless sheds light on the reception of Steven Spielberg’s films. While often hailed as one of cinema’s great technical filmmakers, Spielberg has also been accused of peddling shopworn themes and techniques to audiences. On a superficial level, there are various Spielbergian “tics” such as track-in shots and his frequent collaboration with composer, John Williams. But there are also recurring motifs, from familial dysfunction (Close Encounters of the Third Kind, E.T. the Extra-Terrestrial, Indiana Jones and the Last Crusade, etc.) to threats against humanity from the wild forces of nature (Jaws, the Jurassic Park franchise, etc.). And yet, since the release of Schindler’s List in 1993, perhaps no theme has characterized Spielberg’s work as much as “the hero.” Indeed, while Spielberg has framed the quest of his heroes in a variety of contexts, he has also — in a way that would make Campbell smile — told essentially the same story: the hero (Oskar Schindler, Capt. John Miller in Saving Private Ryan, Abraham Lincoln in Lincoln, etc.) undertakes a mission that will challenge him both morally and emotionally, and yet, through courage and acumen, he is able to overcome the obstacles facing him, thereby providing a “boon” to those he loves. Such, at any rate, is how it appears. And it must be said that Spielberg’s latest film, Bridge of Spies, falls into a similar pattern. 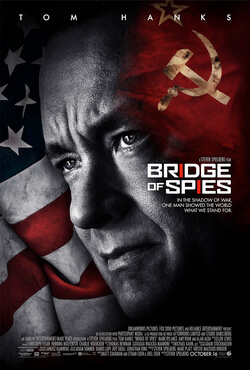 Based on real-life events, the film tells the story of James B. Donovan (Tom Hanks), an American insurance lawyer asked to represent Rudolf Abel (Mark Rylance, in an Oscar-winning performance), an accused Soviet spy. It is the height of the Cold War, an era that Spielberg recreates with customary brilliance, and Donovan is pressured to provide only nominal legal counsel. Although he refuses to go along with such coercion — mostly out of principle, but also out of a grudging appreciation for Abel’s dedication — Donovan loses the case and is left to plead for Abel’s life. He argues that, should an American spy be found in similar straits, Abel would serve as collateral. And, needless to say, that is precisely what happens. In a pair of unrelated incidents, two Americans are captured by Soviet authorities, and both are held in East Germany. Thus the CIA tasks Donovan with a secret mission: he is to travel to East Berlin, where he will seek the exchange of Abel for one or, if possible, both of these American detainees. This proves to be an altogether taxing process. Donovan has to weigh manifold political interests and machinations, whether on the American or on the Soviet side. Moreover, he has to fight through poor housing conditions and an increasingly nasty cold. Still, as if on cue, Spielberg goes on to show that Donovan’s “courage and acumen” ultimately secure a happy, if nevertheless exhausting, outcome. In short, Donovan by no means wants to be a hero; yet, in his intellectual commitment to the good, and in his willingness to act on this commitment, he allows himself to become one. This humble trust in and devotion to the good may not entirely place him and other Spielbergian heroes outside the purview of Campbell’s monomyth. But it does underline how such a concept lacks sufficient nuance. In other words, while Spielberg’s heroes bear the contours of Christ figures — in ethical rather than in ontological terms — such characteristics are hardly shared among many other heroes, who pursue a local good through power, fame, charm, or popular appeal. That is not to say, of course, that Spielberg is making films that intentionally draw on the person of Jesus Christ. It is just to say that, when Spielberg is accused of reworking “hero movies,” the sort of “hero” in question deserves consideration. For, on that score, it may be that Spielberg is more countercultural than often acknowledged.